It’s been such a long time since I’ve done a folklore post that I thought I’d get back into it a bit. And given that I’ve been very focused on tea lately, what better way than to investigate the stories around the origins of tea? Tea has certainly gained a reputation as a drink with a certain amount of ceremony and mystery around it over the centuries, from the tea ceremony of Japan to afternoon tea in the United Kingdom. So it’s only natural that stories have sprung up surrounding the origins of this seemingly-magical beverage. One of the most well-known apocryphal stories of the origins of tea comes from China, where its discovery is attributed to the emperor Shennong, who may or may not exist only in myth. He seems to have been something like an Arthur figure in Chinese mythology and literature, and many advances in Chinese culture and society are attributed to him, particularly the knowledge of agriculture and healing plants. In this story, the emperor has decreed that everyone must boil their water before drinking it for health and safety reasons. One day, while boiling his water, the emperor noticed that some leaves from a nearby tree had fallen in. Rather than discarding the contaminated pot of water in annoyance, he tasted the resulting brew and found it not only delicious, but invigorating. He declared to his people that “Tea gives vigor to the body, contentment to the mind, and determination of purpose.” I, for one, agree with him. The fact that such an important figure in Chinese legend is attributed with discovering tea speaks to its importance in Chinese society. My favorite story of the origins of tea comes from the Zen/Chan Buddhist tradition. When Buddhism first spread out of India, it was brought by the Indian sage Bodhidharma. One of the great feats of meditation that Bodhidharma achieved was meditating while gazing at a wall for nine years. There is a story that he fell asleep seven years into his nine-year meditation, and when he awoke, he was so disgusted with himself that he cut off his own eyelids for betraying him, flinging them to the ground. When they hit the ground, they sprouted the first tea plants, which are thought to be a gift to Buddhist practitioners to encourage wakefulness. To this day, Zen Buddhist meditation sessions are often punctuated with a cup of tea, and supposedly for a long time, the Japanese used the same character for tea as for eyelid. Personally, if Bodhidharma did sacrifice his eyelids for the origin of tea, I would thank him for it, and find the little Daruma dolls of him, with their wide, staring, lidless eyes, to be a welcome addition to my tea table when I enjoy a cup in his memory. 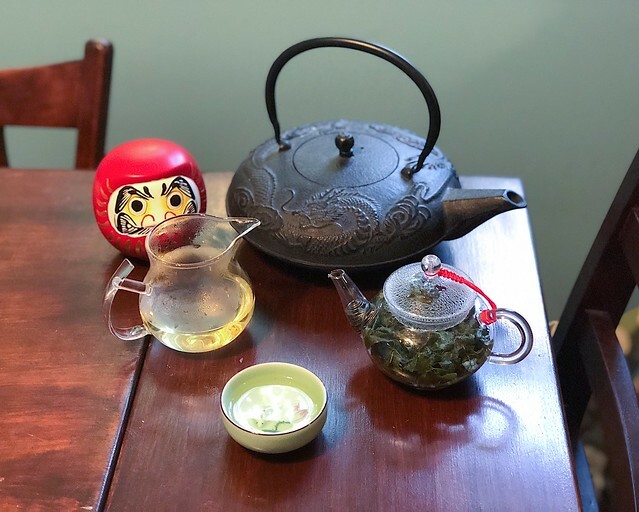 I thought I’d finish with a story related to one of my favorite kinds of tea: Tieguanyin oolong tea. I’ve written before on a story of the Guanyin in China, the goddess of mercy who became a bodhisattva in Buddhist tradition. One story of the origin of tieguanyin tells of a poor farmer named Wei who walked past an abandoned temple with an iron statue of the Guanyin as he walked to and from his fields every day. Distressed by the poor condition of the temple, Wei began to take some time out of his day every day to maintain the temple grounds and light incense to the Guanyin when he passed by, always wishing he had the means to do more. One night, he had a dream of the Guanyin in which she told him of a treasure he would find behind the temple. The next day, he looked and found a small tea shoot, which he took home and nurtured. 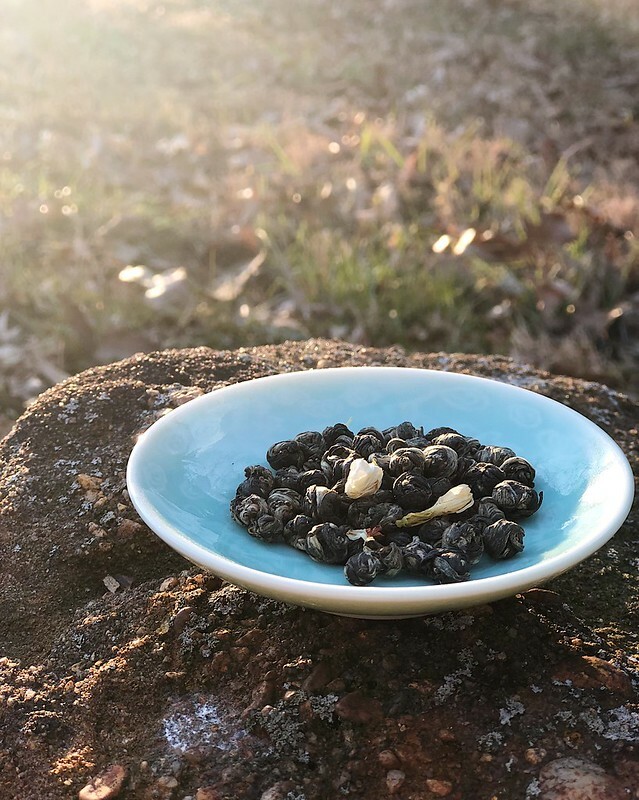 When he made tea from the plant, he found it delicious, named the tea in her honor: Tieguanyin, which means “iron Guanyin” (or, colloquially, “iron goddess of mercy”). I love stories of the Guanyin because they generally involve someone getting rewarded generously for simply doing the right thing quietly and without the expectation of reward, and I love tieguanyin as a cup of tea, so this story was a natural finish to this collection, I think. So there you have three stories of the origins of teas to go with your morning cuppa. NB: I am not a medical doctor and am not making any recommendations for your personal caffeine consumption. If you have a health problem, of course, consult your doctor for advice. This is just how I’ve handled my personal caffeine consumption. As I announced yesterday on my YouTube channel, there’s a reason I’ve been quiet on this blog and on social media: I am pregnant again. 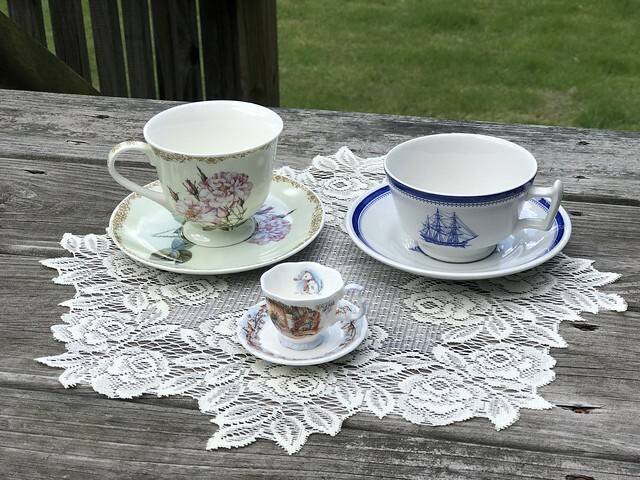 Now, I don’t want this to turn into a pregnancy blog — I’ve even created a separate blog for those who want to more closely follow my pregnancy and parenting updates — but I thought I’d talk about a pregnancy-related topic that is near and dear to my heart: how I’ve handled drinking tea while watching my caffeine intake. Monitoring caffeine is not actually a new thing for me. I have another (minor) health issue that gets exacerbated when I have too much caffeine. But since it’s more uncomfortable than dangerous, I mostly just wing it, assuming I’m taking in less caffeine drinking tea regularly than when I was drinking coffee regularly. When I started trying for a baby, I realized that I should probably figure out how to keep a closer eye on things. Of course, when you look up “caffeine in tea,” you generally get the information back that an 8-oz. cup of tea has 26 mg of caffeine (or maybe it’s 50 mg, depending on your source). And that green tea and white tea have less caffeine than black tea. But then, sometimes you can find sources claiming that green or white tea have more caffeine than black tea. And few sources mention oolong, but mostly assume it’s somewhere between black and green tea. And finally, most of these sources assume that you make a cup of tea by taking a tea bag and putting it in a mug of hot water for 2-5 minutes. So what if you don’t make tea like that? What if you re-steep your leaves? What if you use more leaf than they put in the average tea bag? And what is the actual variation among different tea types? Well, it’s unclear. Oh, and to get this out of the way: You cannot “decaffeinate” tea at home by steeping it for thirty seconds and discarding the first steeping. 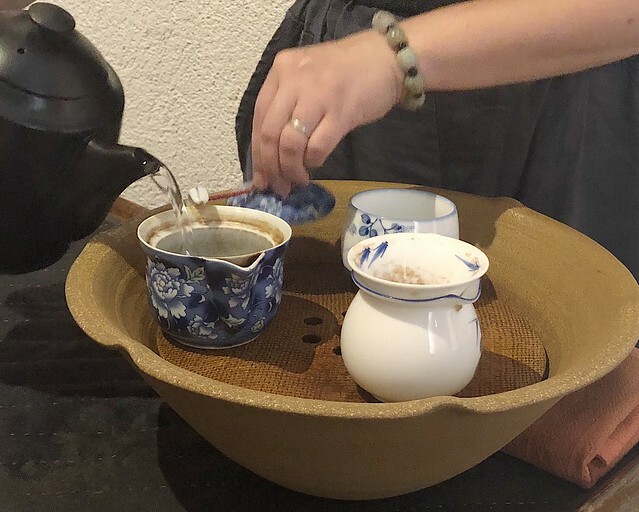 There’s more information about it here, but suffice to say that caffeine is released at a relatively even rate for at least the first 10-20 minutes of steeping, so you’d have to throw away all the enjoyable tea to get “decaffeinated” tea from this method. The first thing I did was to try to get some information about how tea is handled during pregnancy in countries where tea is consumed more widely than coffee. Generally, in the US, tea is lumped together with coffee and is consumed mostly as a drug, for the caffeine. Caffeine is considered a vice, and therefore something that might be dangerous in pregnancy. In other countries, tea is considered a healthy drink, consumed for its benefits rather than as a vice. I did find a few blog posts and articles about women’s experiences with recommendations from doctors in Japan, and this video from Mei Leaf, but there’s not a lot of reliable information about how tea-loving countries handle advising pregnant women on drinking tea. But I do know that the American College of Obstetricians and Gynecologists considered “moderate caffeine intake” below 200 mg per day to not increase risk of miscarriage or preterm birth. Most doctors stick to this number and say that it’s safe to have up to 200 mg of caffeine per day in pregnancy. So, armed with this number, I set out in search of a more accurate way to figure out how much caffeine I was getting from my tea. From here, I decided I should probably consider how I brew tea. Since I generally tend to weigh my loose tea leaves, rather than using a tea bag, I knew I tended to use 3-6 grams of leaf per session. I’ll sometimes go as high as 8 g if I’m doing a flash-steeped gaiwan session. I also knew that brewing time was a factor, so I looked at the various ways I steep teas. 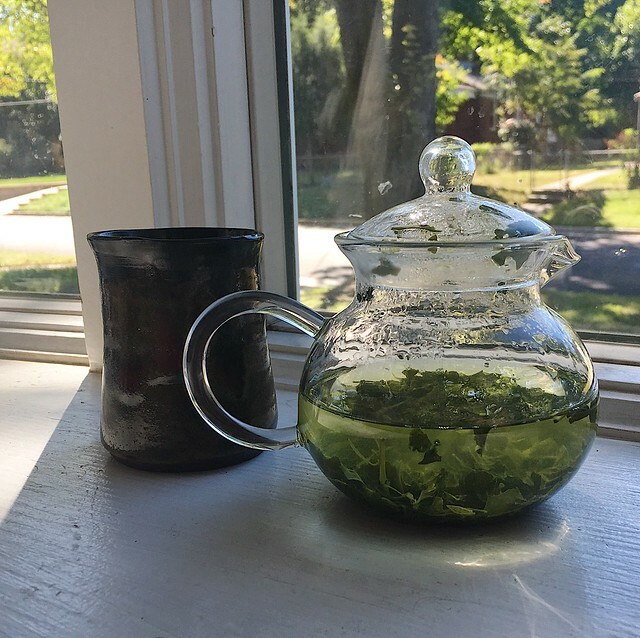 Generally, I like to steep for 30 seconds to maybe a minute or two for each steeping, and I usually do maybe four steepings over the course of a day, so that’s definitely under five minutes of total steeping time. 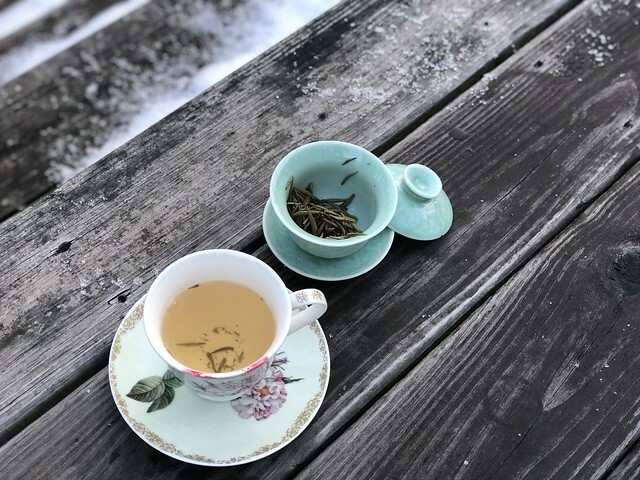 If I look at the white2tea steeping guidelines for a flash-steeping session, those times add up to 275 seconds for ten steepings, or just under five minutes. So I decided I would consider my brewing parameters to be somewhere between 3-5 g of tea steeped for five minutes. Now, let’s talk about assumptions. I’m definitely making some assumptions here. First of all, I’m assuming that water quantity doesn’t really effect caffeine release. I mean, this may not be the best assumption, but at the very least, brewing more tea in the same amount of water shouldn’t make caffeine release more efficient, right? So at worst, my assumption is leading me to overestimate caffeine. Same with water temperature. The studies I found assume water temperature of 100 C, and I often use cooler water. There are studies of water temperature and caffeine release, though I didn’t look them up specifically for this project, but again, I’m assuming that, again, I’m likely overestimating caffeine by disregarding the effects of water temperature. Okay, on to the studies. The first one looks at caffeine and theanine in standardized brews of 39 different teas, with the standard brewing method being to steep 1 g of tea in 100 ml of water for three minutes. For my purposes, I multiplied their caffeine numbers by two to account for my longer brewing time and then by 3-5 to account for my increased tea quantity. So if I wanted to steep 5 grams of tea, I assumed I would need to stick to teas with fewer than 20 mg of caffeine, as reported in Table 2. For 3 g of tea, I could go up to teas with about 30 mg of caffeine. Almost every tea in the study would fall under this amount. I also looked at this post, which got some caffeine information from a couple studies, and expanded the range of tea types I for which I had data. The table in the post considers teas that are brewed with 1 g of tea in 100 ml of water for 30 minutes, which is pretty close to full extraction. So all I did in this case was to multiply the reported number by the amount of tea I would use, which is pretty convenient (and almost certainly exaggerating my caffeine consumption). I especially like this resource for when I want to do a special session with 8 g of a nice pu-erh and want to see just how excessive the caffeine would be. Now, one more note about caffeine in pregnancy: One of the books I got to prepare for pregnancy was called The Panic-Free Pregnancy, which specifically addresses concerns about caffeine in pregnancy. First of all, the author of that book looks at studies of pregnant women consuming caffeine and concludes that 200 mg per day is too conservative and it’s likely that up to 300 mg per day is probably safe. He also points out that, this is meant to be a limit on average consumption, so if you go nuts and have several espressos one day, you’re probably safe if you limit yourself to decaf the next day (fun fact: decaf coffee has a small amount of caffeine and I personally find that it’s enough to ward off the headaches I get when I have no caffeine at all). So I took this as permission to occasionally indulge in a long tea session, without worrying too much, as long as I was careful for a couple days after that. I particularly like Pique Tea tea crystals for the “careful” days because I can be more certain of how much caffeine I’m getting, and one serving of Pique Tea doesn’t seem to ever have more than 50 mg of caffeine. In addition to all of this, Emily Oster, author of Expecting Better, points out that there doesn’t seem to be the correlation between tea consumption and miscarriage the way that there seems to be a correlation between coffee consumption and miscarriage, which suggests that perhaps there is something else at work here besides caffeine affecting things. Take that as you will. One last thing: there is another concern with tea in pregnancy. Apparently catechins, which are found in the highest levels in green tea, can bind with folate, which could potentially increase the risk of folate-related birth defects. While this study did conclude that high consumption of green tea did correlate with lower folate levels, this study concluded that, for women who were taking supplemental folate, increased tea consumption was not associated with an increased risk of spina bifida. Personally, I chose to deal with this by making sure to take a prenatal vitamin (which I started months before becoming pregnant anyway) and also to offset my tea consumption and my vitamin consumption. That is, I drink tea in the morning and take my vitamins in the evening. That way, the vitamins and the tea aren’t in my digestive system at the same time. All in all, you can tell I’ve put a lot of thought into how my tea-drinking could affect my pregnancy. Possibly too much thought (after all, people have been drinking tea for centuries and we’ve managed to keep having babies). But it helped give me peace of mind, and I hope that aggregating some of the information I found helpful might help someone else, too. I’ll close by pointing out that a lot of this research ended up being moot, as my first trimester nausea ended up limiting the amount of tea I drank anyway, mostly because I felt too sick to really enjoy the good stuff. NB: I purchased everything reviewed here for full price with my own money directly from Pique Tea. Pique Tea did offer me a discount code after my initial post on Instagram about their Jasmine tea, but I had already ordered all of this and didn’t use it. 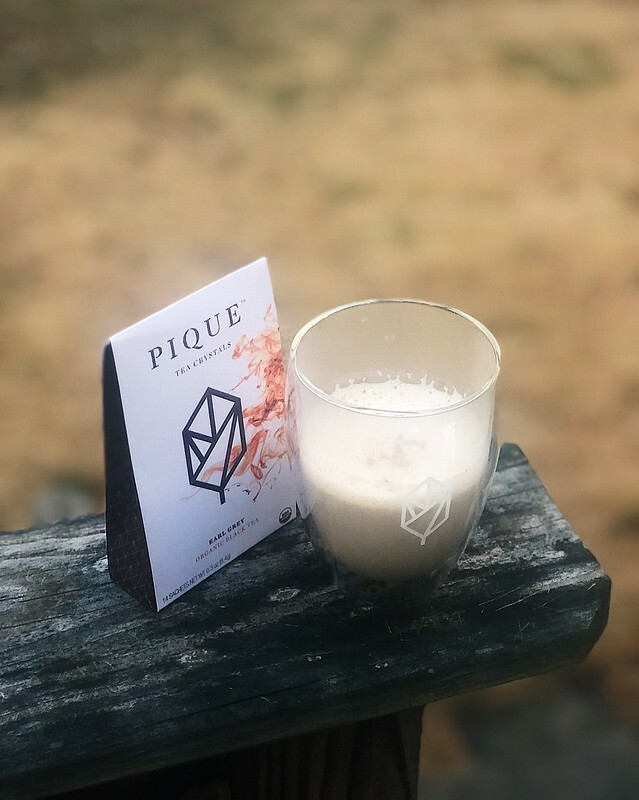 Pique Tea is an interesting company. They claim their product has the same health benefits as high-quality, brewed loose-leaf tea, but in a powdered product. I first saw them at a local herb store and was intrigued. I figured if it wasn’t terrible, it would be a great way to take tea to conferences without having to worry about bags and steeping times and water temperature. When I tried the flavor I first got (Jasmine), I was so impressed, I decided to buy everything and review it all in one go. Since I love Tracy’s mega-review of Glossier over at Fanserviced-B, I thought I’d do my review in a similar style. I should probably give a little info about my likes and dislikes and how I do tea. First of all, I love the ritual of tea, so something like this is never going to fully replace my tea leaves. But two things have come up for me recently. First of all, I travel semi-regularly and never know what the situation is going to be in terms of tea availability at conferences. Since I’m supposed to be a representative of my organization, I strive not to appear too eccentric or high-maintenance when I travel, which means that loose-leaf tea is pretty much out. I’m stuck with tea bags, and I have to worry that I’ll get caught up in a conversation and forget how long I’ve steeped my tea. These tea crystals definitely work great for travel, and I even convinced a researcher at a recent conference to try them for her field expeditions! Second is that my husband and I have been trying to have a baby, and one of the things to worry about is caffeine intake. Because most of the information about caffeine in tea out there is pretty much wrong, and it varies so much due to factors such as brewing parameters, using a product like Pique helps me get a better handle on how much caffeine I’m consuming. They not only test their products and post the caffeine range on each product’s page, they also report numbers that I find believable and not just taken from old estimates of caffeine in general tea types. For example, they report that their Jasmine Green Tea has a higher level of caffeine than their Earl Grey Black Tea, which goes contrary to the conventional thought that green tea has less caffeine than black tea, but is more in line with more accurate research that suggests that processing doesn’t affect caffeine levels as much as previously thought. Jasmine Green Tea: This was the first one I tried and I was impressed. This tastes exactly like a brewed cup of Rishi Tea full-leaf Jasmine Green Tea. Plus, I just love jasmine tea. Sencha Green Tea: This has that classic Japanese restaurant tea taste. It doesn’t have the ocean notes of really good sencha tea, but it’s a solid Japanese green tea. Mint Sencha Green Tea: This brings back memories of Teavana Moroccan Mint tea. I like it in the afternoons after a snack or right after lunch to cleanse my palate and keep me from snacking more. Peach Ginger Black Tea: This is a weird choice for me to like, but it tastes like exactly what I wish Republic of Tea’s Peach Ginger Black Tea tasted like. A great ginger kick, subtly peachy, but not cloying. I haven’t tried this iced, but I imagine it will be great that way, too. English Breakfast Black Tea: I find the other two Pique black teas to be a bit harsh drunk plain. So this is just okay, but it really makes a fantastic morning cuppa with a splash of milk and a spoonful of sugar or honey. I actually drink a sweet milky cup of this before going to the gym in the early morning. Passion Fruit Green Tea: It isn’t really this tea’s fault that I don’t think it’s great. I really don’t prefer nontraditional fruity teas. But it’s a great representation of a not-too-cloying fruity green tea. Again, probably would be great iced. The Pique Cup: I couldn’t call this great because, well, it’s just a cup. But it’s attractive, has a sort of millennial-minimalist flair, and the double-walled construction does a great job of insulating your hands from the hot beverage. It’s not my style, but if you’re into it, it’s sturdy but not clunky and holds the perfect cup of tea. Hibiscus Mint Herbal Tea: I hate stevia. I hate all non-nutritive sweeteners, so I don’t really single out stevia. But stevia has crept into “healthy” foods and beverages and to my taste, has ruined them. And it’s a shame, because once my taste buds started saturating a little to the stevia taste, I could detect some really nice tart and herbal notes in this tea. But I haven’t had more than my first cup because I really hate stevia. If they ever decided to try a non-sweetened version of this, I’d be first in line to try it again. Add the packet of Earl Grey tea crystals to your cup. Add the lavender, honey, and milk to a small saucepan and put over medium-low heat. Heat over the course of 10 minutes, stirring occasionally, until the honey has dissolved and it reaches at least 165 degrees Fahrenheit (no more than 180 degrees). Strain into the cup with the tea crystals, making sure your strainer does not touch the surface of the liquid in the cup. Froth with an electric hand frother for a few seconds, until a little foam forms. Drink as soon as it’s cooled off enough. 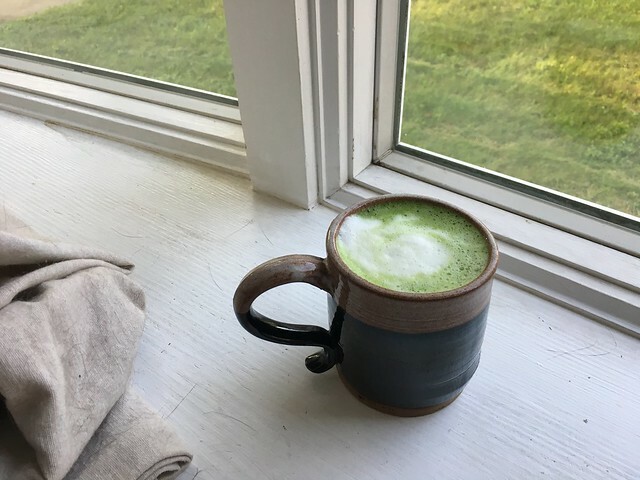 This week, I’m celebrating Matcha Week to highlight all the ways I use matcha besides in my morning bowl of traditional thin matcha. I’m promoting my Volition Beauty campaign for a matcha-infused dual-targeted hair mask, which has just over a month longer to get all the votes it needs to go into production. Help me out by voting here, and maybe share my campaign with your friends and followers to help make this product a reality. 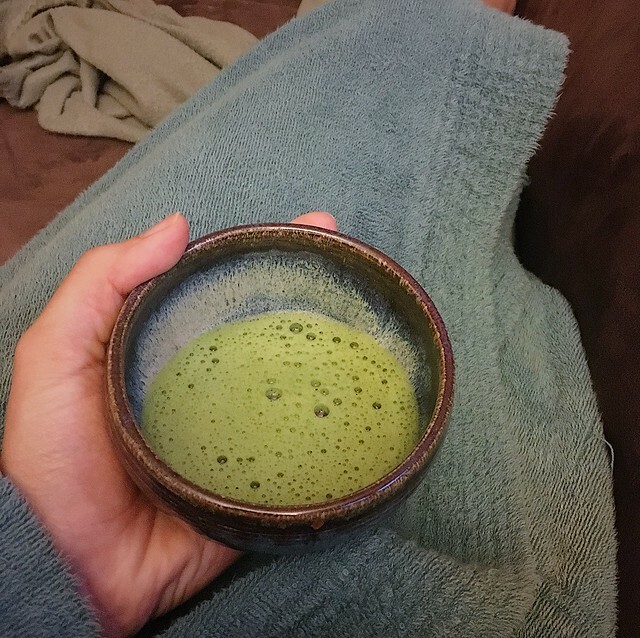 To close off the week, I thought I’d share a matcha food recipe. I wanted to make a matcha bundt cake, but my previous tests with the recipe were unsatisfactory and I ran out of time. So I present to you: Matcha Pancakes! This was a spur-of-the-moment idea when Mr. Tweed and I decided to make pancakes for our Sunday breakfast. 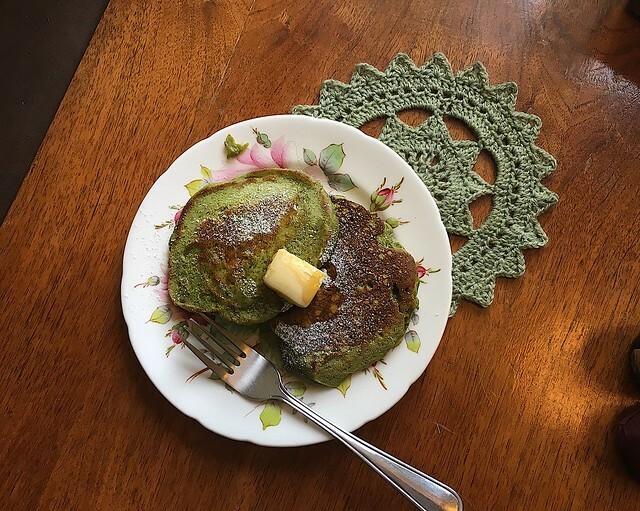 I decided to add a little extra sugar and some matcha powder to our pancake batter, which made for a delightfully green batter and a pleasantly subtle matcha flavor in the resultant pancakes. It was a fun change to the standard breakfast pancake, and I’d definitely do it again sometime. Although, be warned, that with a full tablespoon of matcha in a relatively small batch of pancakes, so there is a non-negligible amount of caffeine in a stack. Sift together the dry ingredients and whisk together the wet ingredients. Add the wet to the dry and mix. Cook over medium heat in a buttered pan. Makes about 10-12 pancakes. One final note: As you can probably tell by my erratic posting schedule, I’ve had some things going on that distract from this blog. One is a project that will be announced tomorrow, but the other is a bit more personal. While I don’t know how much I’ll feel like sharing in the future, know that I am physically fine and will return to blogging regularly as soon as I can. Thanks to all my readers for making this a positive part of my life. I should still be on Instagram, if you feel like checking in (at the very least, I tend to respond to messages, even if I’m not posting). 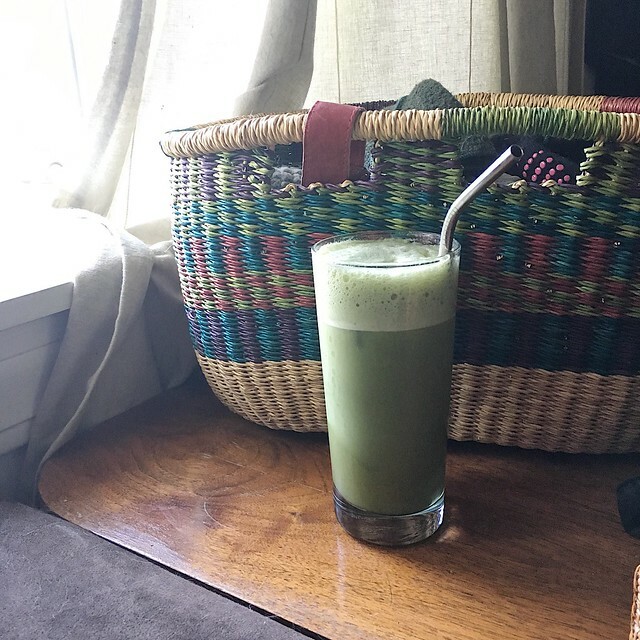 Today, I’m talking about the homemade ways I use matcha in my beauty routines by talking about recipes for a matcha face mask and a matcha hair mask. Anyone who follows my Instagram Story might have caught me a few weeks ago being silly with a very green face mask. Spending 10-20 minutes with green goo on my face gave me a lot of time to make copious references to Kermit the Frog and the Incredible Hulk. But matcha face masks are not just for nerdy references and Instagram photo ops. I found that my matcha face mask helps keep my skin soft and clear. I already use a weekly clay mask, but adding some extra goodies just amps up the effect on my skin. My go-to recipe is more semi-homemade than a real DIY. I take about a 1/2 tsp. of matcha and 1/2-1 tsp. of raw honey and add it to my favorite clay mask (the Cattier green clay). I mix that up, adding a few drops of my favorite hydrating toner (Klairs) if it’s a bit dry, until it’s about the consistency of frosting. I brush that onto dry skin after oil cleansing and leave it on for 10-20 minutes. Then, I rinse it off and wash with my second cleanser to remove bits of mask. The matcha I use is just a cheap culinary-grade powder from Amazon and it’s not the finest grind, so I get a bit of physical exfoliation when I rinse, so I avoid chemical exfoliants when I use this mask. And I always use a hydrating sheet mask afterwards, as is my custom when I use a clay mask. For my hair, I like to add the matcha and honey to my favorite clarifying shampoo, which is currently the HiF Intensive Detox. This is technically a cleansing conditioner, but it cleanses well and its thick consistency makes it nice for a hair mask. I apply the mask to the roots of wet hair and let it sit for 3-5 minutes while I do other shower things. I usually apply a moisturizing mask to my ends while I’m masking my roots. Then, I rinse everything out really, really thoroughly. 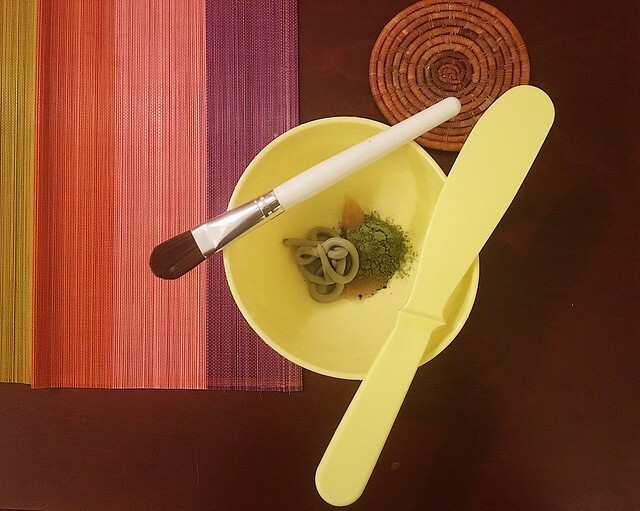 Of course, if you’re interested in matcha hair masking but don’t want to mess around with mixing your own, you can always support my Volition campaign (hint). So that’s yet another way I add matcha to my life each week, other than just drinking it traditionally. I hope I can inspire you to experiment with adding tea to your beauty routine.